As I don't want to keep anyone hanging, here's one from the archives.... 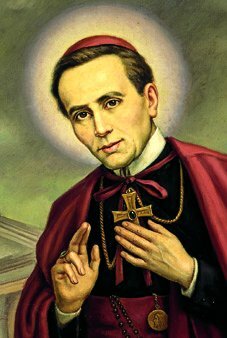 It's time-appropriate as tomorrow's the birthday (195th, to be precise) of the fourth bishop of our fair town, St. John Neumann. Most people probably don't know what today is -- well, it's January 5 of course -- but here's a brief primer on something more. Today is the feast of St. John Neumann, the fourth bishop of Philadelphia. The life of John Neumann, the first Redemptorist to be professed in America, continues to set the gold standard of "humble service," and it serves as a reminder that the more things change, the more they stay the same. John Nepoumecene Neumann -- the name is properly prounounced "NOY-man" but, ironically, the saint is still usually confused with the more-famous English cardinal of the Oxford movement -- was born in Bohemia (now the Czech Republic) in 1811. He was a simple man in a time of clerical decadence, and given that he came from no great fortune and wasn't seen to have any of the superficially desired qualities of a priest, he was turned down by bishops in his home country and elsewhere in Eastern Europe. So he came to America, where he studied for the diocese of New York, for which he was ordained. At his first Mass, he uttered a simple prayer which is still closely affiliated with him: "Dearest God, give me holiness." Then as now, it was lonely on the road. Neumann had come across a band of Redemptorists and was attracted to their charism and community spirit, so he excardinated from the secular clergy into the order founded by St. Alphonsus Liguori. The Reds maintained a significant presence in Baltimore, and Fr Neumann was named pastor of St. Alphonsus church there, a position in which his fame spread as a solid confessor and a priest devoted to the welfare of the poor and the care of the sick. In time, he also became the American head of his Congregation. Such was Neumann's reputation that one of his penitents was the city's new archbishop, Francis Patrick Kenrick, the Irish-born cleric who had arrived in the premier See 1851 after 21 years in charge of the diocese of Philadelphia. As the metropolitan of the province and Philadelphia's former bishop, one of Kenrick's first tasks was the selection of a suitable successor for the local church to his north, which spanned from the cosmopolitan See city through newly-inhabited coal regions, rural farmlands and was burgeoning both in population and demand for adequate pastoral care. Kenrick had confided to Neumann that he had placed the confessor's name forward for the bishopric of Philadelphia, and Neumann refused, citing his own insufficiencies and begging to be taken out of contention. (How often do you see such a thing, again?) One night, on arriving back at his rectory, the pastor was informed that, while he was out, the archbishop had dropped by with "some papers," which he had placed in Fr Neumann's room. Neumann, dreading what he perceived as the worst, walked in to see a glimmer reflecting off the candlelight. Kenrick's delivery wasn't "papers," but a pectoral cross and ring for his successor, and there was no way out -- the archbishop had the appointment documents rigged so that Bishop-elect Neumann was forced to accept the burden under obedience. On his 41st birthday, 28 March 1852, John Neumann was ordained to the episcopacy at St. Alphonsus, Baltimore. Arriving in Philadelphia, Bishop Neumann was able to build on the fruits of his predecessor's stewardship -- Kenrick, coadjutor from 1830-42 and ordinary for the nine years following, had quelled a popular revolt in the city parishes in the 1830s, guided the Catholic community through the Know-Nothing spate of church-burnings in 1844, opened St. Charles Seminary in 1832 and selected the ground plot and begun work on a permanent cathedral for the Philadelphia diocese in 1846. While Kenrick stabilized and built up the externals of the diocese -- which, in 1852, still comprised the Eastern half of Pennsylvania, southern New Jersey and the whole of Delaware (a separate See had been founded at Pittsburgh the decade before for Western Pennsylvania, and New Jersey would be handled two years later with the creation of the diocese of Newark) -- Neumann sought to tend to its spiritual needs. He brought the time-honored European custom of the Forty Hours to the United States, beginning it in Philadelphia's St. Philip Neri church not long after his installation. He founded the parochial school system in Philadelphia as an alternative to the Protestant-influenced public schools. And, never one for administration, the bishop spent the bulk of his time on the road, traveling by carriage to the obscure towns of the hinterlands to hear confessions, say Mass in homes and practice a ministry which led more by on-the-ground priestly example than by the stern, removed exercise of episcopal authority. Of course, something had to give due to Bishop Neumann's emphasis on one-on-one ministry, and he was more than willing to sacrifice the temporal and administrative end of things. Construction on Kenrick's grand cathedral, designed in the Romanesque style by Napoleon LeBrun, the architect of the United States Capitol, practically languished as Neumann divested its share of the diocesan budget to the care of the poor and the indigent. Decisions were spun off to the vicars-general and, given his travels, the chances for his curia to correspond with the traveling bishop were few and far-between. Not long after his arrival, recognizing what he saw as his insufficiencies, Neumann requested a coadjutor from Rome to handle the administrative affairs of the diocese. In 1856, the Holy See answered in the person of James Frederic Wood, a priest of Cincinatti who had been a convert from Unitarianism and received into the church by the city's legendary archbishop, John Baptist Purcell. Wood, a native Philadelphian, had been a successful banker before his ordination, so he was particularly well-suited to deal with the financial situation of the diocese, a burden Bishop Neumann was relieved to delegate. Citing Wood's preparedness to assume the reins of the Philadelphia diocese, Neumann continued that he was fully prepared "to resign from the episcopate [altogether] and to go where I may more securely prepare myself for death and for the account which must be rendered to the Divine Justice." He never had the chance. Walking down Vine Street in Philadelphia to hand-deliver a package to a poor family, John Neumann collapsed on the sidewalk and died on 5 January 1860. He was 48. Philadelphia's fourth bishop was beatified by Paul VI in 1963 and canonized by Paul in 1977. In accordance with Neumann's wishes, his remains were buried not with the bishops of Philadelphia (who were then laid to rest in the Bishops' Cemetery, which is now a Rite-Aid pharmacy), but at the Redemptorist home-base at St. Peter's church north of downtown, where they remain on public view for the pilgrims who continue to flock, seeking the help of the simple man who, though slight on the scale of history and in the eyes of men, was nothing short of exemplary in the eyes of God.